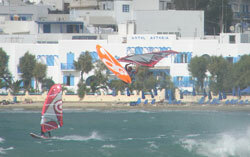 For water sports, most popular is windsurfing, an activity which is favored by the meltemi, the medium strength north wind which blows in the summer during the day. 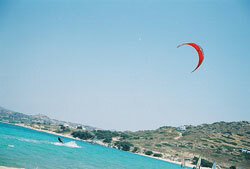 In Naxos there are beaches which are suited for windsurfers of all levels and preferences (slalom, speed or wave); the best conditions for slalom and speed are at Agios Prokopis, Agia Anna, Mikri Vigla and Pirgaki. On Ai Giorgis, Agios Prokopis, Agia Anna and Mikri Vigla there are sports centers fitted with modern equipment.